How do you compare excel sheets? If you still doing it the old way: navigate back and forth in one Excel window or open two Excel and align it to each other, then you might consider using a free tool to compare it automatically. 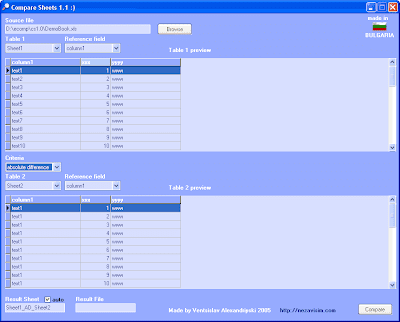 Compare Sheets is a free portable software that can do the comparison of MS Excel sheets for you. Take note that you do not need MS Excel or any other software that opens MS Excel files in order to use Compare Sheets. To use it just open the Excel document and it will automatically display the first two sheets of the document in two tables. Its limitation is that it can only open standard xls documents and xlsx documents are not supported. This freeware is for Windows operating system (XP, Vista, Windows 7). Download link to Compare Sheets. very nice and unique post.